Honor your parents: that’s a rule, right? And don’t kill or steal or tell lies to hurt someone. Good rules, all written down for us. Growing up, I had some unwritten rules by which to abide: don’t talk back to your parents; homework before TV; straight home after school; keep your room clean. I’ve learned to appreciate rules, even depend on them. If it isn’t against the rules, it’s probably okay. Rules give us boundaries and guides to keep us out of trouble. I’ve been in plenty of trouble through the years but it seems like much of it could have been avoided if I’d only known the rule that applied. For this reason, I like rules! I actually like it that there are traffic lights to control the flow of sixteen lanes of cars going four directions, even while I’m chaffing at the red light. If I’m trying to make a left turn into heavy traffic, those lights (and the law enforcement behind them) give me a fighting chance of survival. Sometimes we get into a tangle trying to interpret the rules, especially the ones that seem obscure or vague. What exactly does it mean to “bear false witness”? Does that include flattery? Can we never stretch the truth to spare someone’s feelings about an atrocious haircut? What about political correctness? I drive my husband batty sometimes, trying to abide by The Rules. He teases me about it. 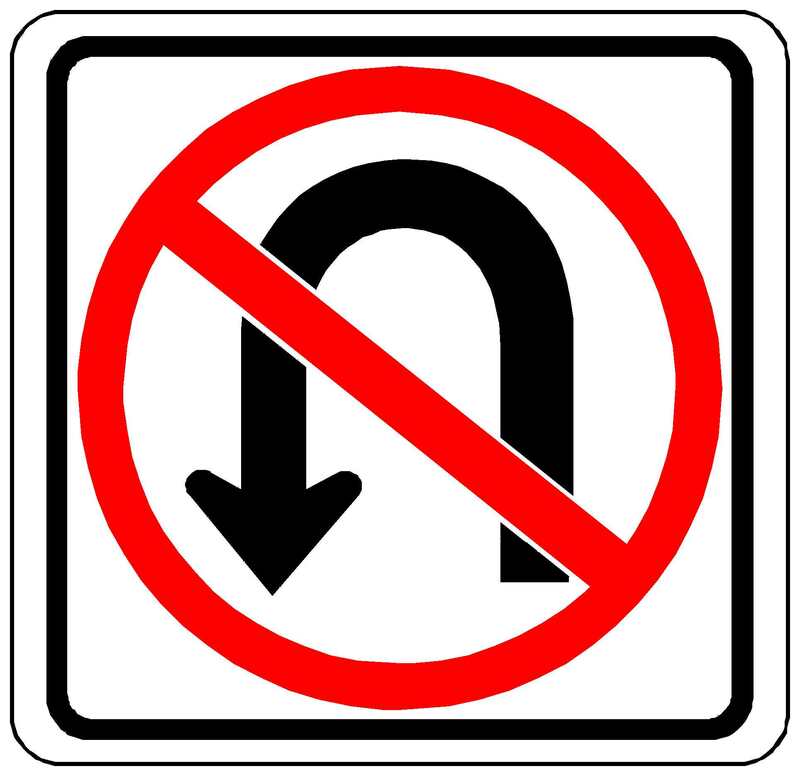 “You can’t make a u-turn here!” I tell him every time we visit Oklahoma. Those who interpret rules for us often walk a tightrope. We elect judges (or elect the people who appoint them) to understand the intent of our laws, hand down judgments and stop endless wrangling or fisticuffs or worse. We don’t always agree with their decisions but at least we know where we stand. Then our elected representatives write more rules based on what the judges say, so we don’t have to go to court over that rule any more. Ah, the law libraries are overflowing with laws, torts, statutes and rules! It seems like most of life is spent trying to figure out what we are supposed to be doing, what we shouldn’t be doing and what would have worked better had we known. They say ignorance is no excuse for breaking the law. I sure will be glad when we get them all written down. This entry was posted in Short Takes on Life and tagged ignorance is bliss, laws for our protection, no turning back, no u-turn, regrets, Supreme Court judgments, unwritten rules. Bookmark the permalink.